Unlike traditional putting green cups and flags, PushNPutt innovative flagsticks are interactive. Our patented design reduces the need to bend over to retrieve golf balls, which lessens strain on your back and knees. And they can also reduce your maintenance costs as players no longer need to dig for their golf balls with their putters, scraping the cups and surrounding turf. For the most innovative golf product in the last fifty years, order your PushNPutt flagstick today! Jerry Mallonee was inspired to create our innovative putting green cups and flags after playing a round of golf with his father-in-law, who was having trouble retrieving his golf ball. When Jerry came over to help, he noticed that the year ‘1958’ was stamped on the bottom of the cup. Not many new design have been introduced into the sport in over sixty years. This inspired Jerry to create the world’s first interactive golf flagstick. Sourcing the best materials and manufacturing his product in North Carolina, Jerry created PushNPutt. The interactive flagstick puts other putting green cups and flags to shame. Instead of bending over to retrieve your golf balls – or digging them out using the head of your putter – just push down on the flagstick. The false bottom in the cup will rise, lifting your golf balls and evenly dispersing them onto the green. Minimize stress to your back and knees and increase your putt time with PushNPutt. PushNPutt is perfect for all golfers – no matter your age or ability. In addition to our original PushNPutt model, we also offer the LiftNPutt. This version also seamless and effortlessly lifts the golf balls from the cup and onto the green. But instead of pushing down on the flagstick, just lift up! We also stock the PutterUp flagstick, which is a miniature version of the LiftNPutt model. However, the PutterUp mini golf flagstick features a unique hook on top of the flagstick. Simply hook your putter on the knob and use it to gently pull up. 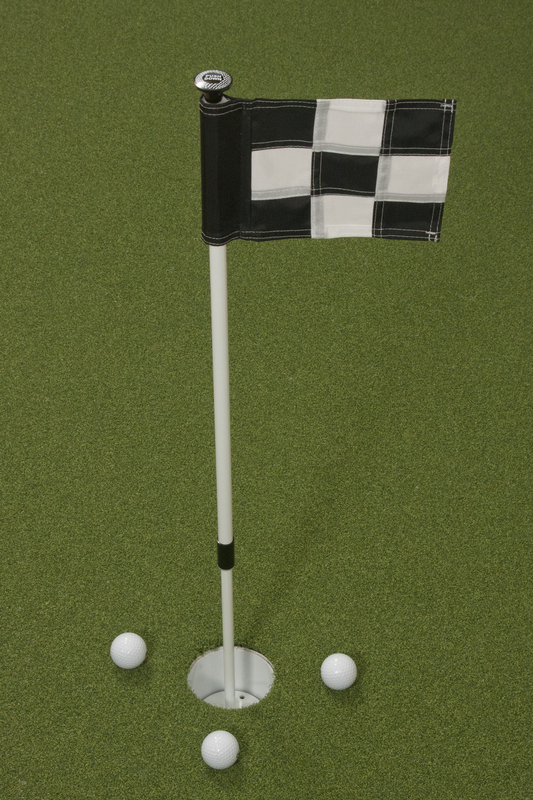 No matter your ability, course design or golfing needs, we stock the interactive putting green cups and flags for you. In addition to increasing your putt time by minimizing retrieval efforts, our flagsticks also protect your turf! Players no longer need to dig out their golf balls using the putters or other clubs. Prevent damage to your cup and surrounding turf with PushNPutt. Whenever you’re done, the flagstick is easily removable. And with so many different colors and custom embroidered flags available, you can truly make it one of a kind! When you’re ready to own one of the most innovative products in the golf industry for the last fifty years, shop the selection at PushNPutt. We’re so confident in the durability of our product that we back it with a one-year warranty. Contact us today with any questions!